The Fame G-300 is an ideal entry-level keyboard. Equipped with 61 velocity-sensitive keys, 633 sound colours and 220 styles, it offers everything a new keyboard player is looking for. In addition, the G300 offers a music library with 150 songs and a learning system that ensures fast success. A microphone input, an AUX input and a USB connection complete the extensive on-board equipment. 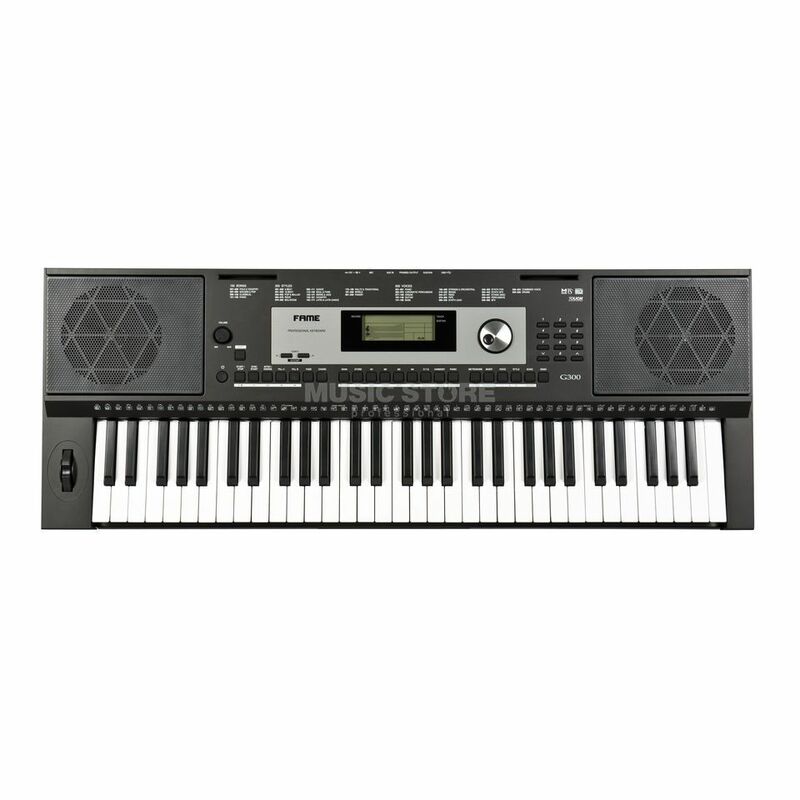 The Fame G-300 has 61 velocity-sensitive keys that react to the dynamics of the sound, depending on the intensity. This gives the keyboard beginner an authentic feel right from the start. A wide range of sound colours are integrated into the G-300. 633 different sounds (ranging from piano, wind instruments, orchestral instruments and drum sounds) mean you will find everything you need for your music pieces included in-the-box, and in high quality. The G-300 already has 220 accompanying rhythms on board to ensure you keep good time from the start. Regardless of whether standard rhythms like Waltz, Foxtrott or more modern dance rhythms, you always have the right accompaniment available. Whether for practicing in the classroom or for making music at home, the G-300 offers the right equipment for every occasion. The Fame G-300 keyboard is equipped with many connections as standard. You can connect an external sound source such as an iPhone, iPad or MP3 player via the AUX connection, let your music run and play along to it. If you cannot do that, you can connect a microphone and have a complete karaoke machine available. The USB port allows you to connect the keyboard to a computer to create high-quality recordings or compositions using the appropriate software. that's an affordable entry keyboard (had it for 99,00 €) & has the advantage to be feeded by batteries & power supply! nice sounds but basic, you got what you payed for. very good keyboard for all ages. This keyboard is easy to use. The sound is clear and it works well. It has a lot of functions that make the experience of playing a lot more fun. it is a very good price. I wasn't sure what kind of quality I would get from this keyboard based on the price, but it surpassed my expectations across the board. It's a great learning/practice keyboard for the family, and we were able to plug it into a piano learning app on an Android tablet using an USB OTG adaptor.